While the federal government continues to shrink — the September figure is down 3.1 percent from a year ago — state and local government jobs have begun to grow again, albeit slowly. September is, of course, a month when teachers are back on the job, and it is useful to look at the unadjusted numbers each year to see how school employment is growing, or not. 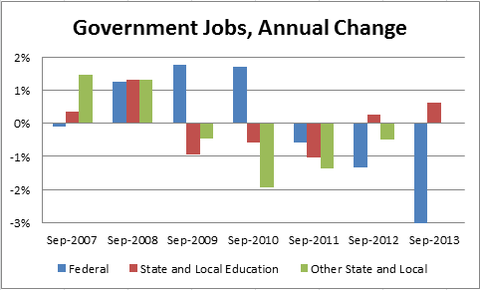 Over the past 12 months, the number of people working in state and local government education jobs rose 0.6 percent. The prior year, through September 2012, the figure was up 0.3 percent. That came after three consecutive years of declines. Other state and local jobs are up 0.02 percent — 2,000 jobs — over the past 12 months. That is not much, but if revisions do not change it, a string of four consecutive annual declines will have been erased. The following chart shows the percent changes in government jobs, from September to September, since 2007. The federal government figures exclude temporary jobs hired for the 2010 census.